Intel’s new low-end NUC PC kits are now available for pre-order, bringing the cost of a mini bare-bones PC down to just $129. NUC (short for Next Unit of Computing) is Intel’s brand of small, build-your-own PC kits, which have been around for about two years now. The kits include a motherboard, processor, power supply, and all kinds of input/output ports; users supply their own storage, RAM, operating system, monitor and input devices. While the original NUC kits cost more than $300, the latest models are much cheaper thanks to Intel’s Braswell processors. Not to be confused with the Broadwell chips found in most Ultrabook laptops, Braswell is more akin to what you’d find in a tablet or netbook, though as Ars Technica notes, it runs at a higher TDP to allow for sustained higher speeds—perfect for a desktop PC that’s not drawing battery power. The new NUCs beg for home theater use, with support for 4K video streaming and TOSLINK optical audio output. Other specs include VGA and HDMI outputs, an SDXC card slot, four USB 3.0 ports (including a charging port that works when the PC’s power is off), an ethernet port, a headphone jack, and 802.11ac Wi-Fi. These aren’t fanless designs, though they should run quieter than a typical desktop. Right now, Amazon has two models up for pre-order. 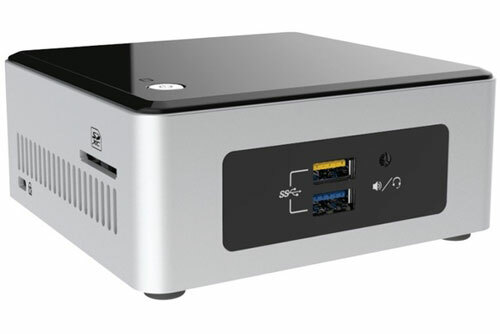 The $129 NUC5CPYH has a dual-core Celeron N3050 processor and ships in two to four weeks, while the $172 NUC5PPYH has a quad-core Pentium N3700 processor and ships in a month or two. Either way, factor in at least a couple hundred bucks more for Windows, storage, and RAM. Why this matters: The size of Intel’s NUCs have always looked like they’d fit in a living room, but hadn’t quite nailed the balance between power and price. These new models look more promising, especially with 4K video support, and tout the cheapest entry cost we’ve seen yet. When shopping for a web host, some business owners first look at solutions that are close to home. That’s a natural response, but in many cases, an offshore host might make more sense. Here’s a look at some of the advantages that an offshore web host can provide. Web site loading times are directly impacted by the distance data has to travel from the host to the user requesting the web page. If you live in San Francisco, a server physically located in Los Angeles will tend to be more responsive than one located in New York. But it’s unlikely that all of your users live in San Francisco, and not all are likely to live in the United States, even. America is a big place. Did you know that New York is actually closer to Iceland than it is to San Francisco? Additionally, your European customers accessing servers in Iceland are likely to receive a response faster than from servers in the U.S. In reality, the differences in load times among servers in the U.S., Europe, and in between are unlikely to be significant, but if you’re looking to provide the highest level of performance to the broadest number of potential users, offshore web hosting deserve serious consideration. The NSA’s invasive surveillance and data interception practices became headline news in 2013, and while groups like the EFF are fighting back, it seems that no U.S. provider has been safe from the agency’s clutches. The emphasis in that statement is on U.S. providers. The NSA has no jurisdiction over offshore servers, which means data stored on these systems is safe from prying eyes. National laws regarding who can demand access to data vary from country to country, but Iceland is highly regarded for its strict protection of data privacy – going even further than the European Union’s liberal privacy regulations. Legislation is in the works to strengthen these regulations even further as part of Iceland’sInternational Modern Media Initiative. Even if you run a website where privacy doesn’t seem to be a critical issue, think about how your users view privacy – and what kind of message it sends if you tell them how highly you value it, too. As well, any good web host, regardless of where it’s located, should offer secure tools to protect your account, such as data encryption and two-factor authentication. As users we don’t see it, but web hosting eats up a lot of energy, and that energy has to come from somewhere. In the U.S., that typically means the power grid, which is largely energized through the burning of carbon-spewing fossil fuels. What’s more, the more popular your website becomes, the more energy it uses, which means a larger carbon footprint and higher contribution to pollution and greenhouse gases. It isn’t like this everywhere, though. Iceland’s electrical power is generated almost exclusively from geothermal and hydropower sources. Utilizing a green host powered by sustainable energy may make you feel better about the kind of business you’re running. Plus, making an effort to be sustainable sends a powerful message to your customers about your commitment to the planet.